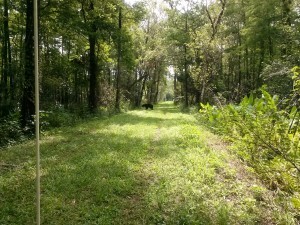 A Florida black bear was sighted at Bird Rookery Swamp today by CREW volunteer George Luther as he worked to remove some downed trees off the trails. The bear was seen twice within 30 minutes along the grassy tram trail. So next time you are there, be on the look out for these magnificent creatures who make their home in Bird Rookery Swamp. Have you seen a bear on the CREW Trails? Tell us when and where.